It now looks as if Syria, albeit devastated and depopulated, is back where it was before the attempt to topple the Assad regime. That means reconstruction, which will bring official and commercial visitors, and an eventual revival of tourism for vital foreign exchange. Clio of Paris is already re-advertising cultural tours, although contrary to advice from the French foreign ministry. The problem for would-be travellers is obviously threefold. Is it completely safe? Where is there to stay? And what is there left to see? Two years before the uprising, I passed through Syria in order to cover Benedict XVI’s pilgrimage to neighbouring Jordan, so I can write only about normal sightseeing, noting that many historic places of interest still stand or, as in the case of all six World Heritage Sites, are already being restored. These include Palmyra at an oasis 135 miles north-east of the capital, Damascus. The ruins, only some of which were smashed, encapsulate much of Syria’s history under Jewish, Persian, Greek, Roman and Byzantine rule. The whole land then made an important contribution to Islamic civilization even before the Ottoman occupation that began in 1516. Four centuries later, the Turks were ousted by British imperial forces that included Australian cavalry, and an almost triangular territory was carved out to become a French mandate for another quarter of a century. Turkey remains its northern neighbour, with Lebanon cutting into the Mediterranean coastline that still leaves such ports as Latakia. It is also a seaside resort, but while spared serious damage, it has had to accommodate many refugees as well as a Russian air-base. To the south lie Israel and Jordan, while Syria’s easternmost border is marked by the Tigris, and the Euphrates actually divides the inhabited part of Syria from a large stretch of desert. 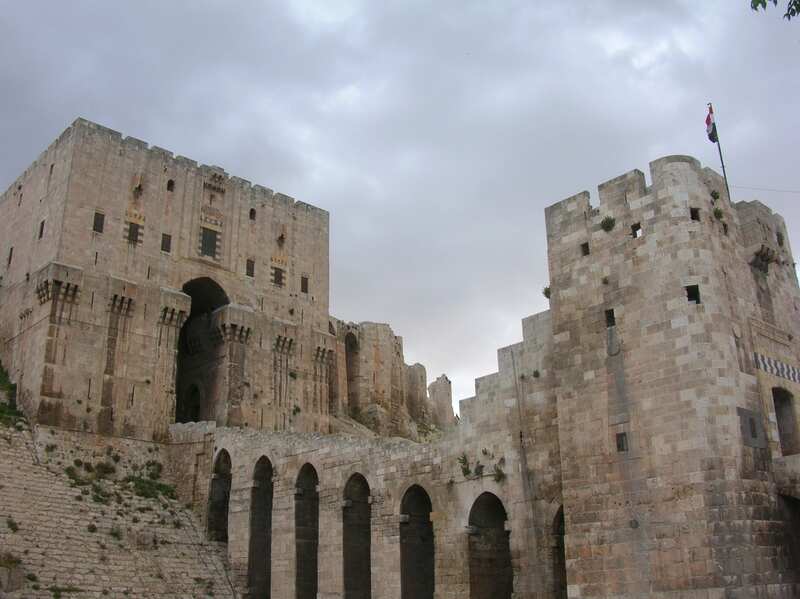 Syria’s northernmost city is Aleppo which has been a commercial metropolis since it was on the Silk Road from China, and in the sixteenth century it became the first town with a British consul. Its main feature is the citadel that held out against the crusaders, but a bomb destroyed part of the wall during the civil war. Shellfire caused massive damage to the great mosque named after John the Baptist’s father, Zachary, toppling its minaret and battering its walls. 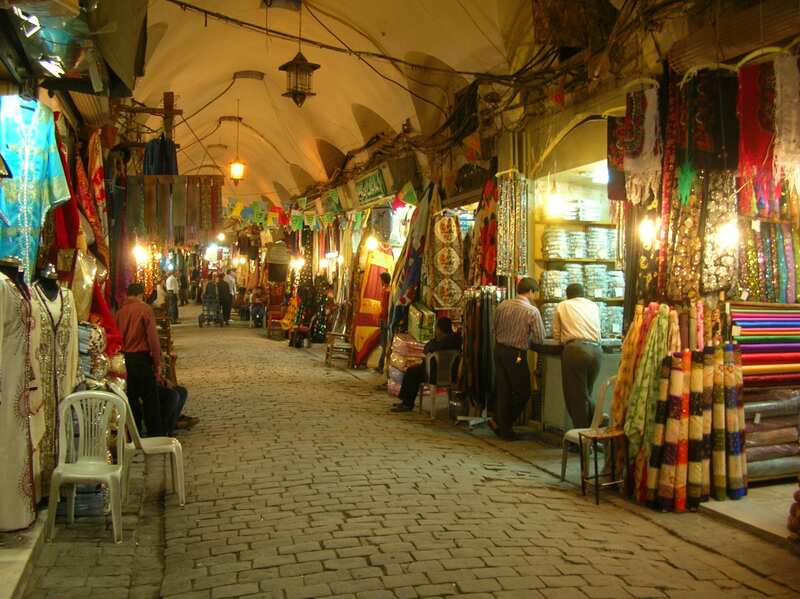 Nearby was the world’s largest covered market (Al-Madina souk) with alleys specialising everything from sweets, gold and soap to daggers, perfumes and spices. Alas, it was swept by fire. Altogether, 60% of Aleppo was badly hit, with half of that area razed to the ground. Yet only 20 of the 50 churches, with a dozen different liturgies, have suffered various degrees of damage. And the archaeological museum appears unscathed, although another five museums in Syria were looted. Nearby is Aleppo’s most famous restaurant, Cantara, and some of the cheapest lodgings are hereabouts, while others are clustered round the Baron Hotel whose guests included Lawrance of Arabia, Agathe Christie and Lady Mountbatten as well as several heads of state. It remains Syria’s oldest hotel, having suffered only minor damage, while several modern ones are still open, including the five-star Dedeman – unlike the flattened Carlton. Halfway between Aleppo and Damascus is Homs which suffered wholesale damage during a siege from 2012 to 2014, yet still retains some buildings of cultural interest such as the Khalid ibn al-Walid mosque, although its interior is wrecked. 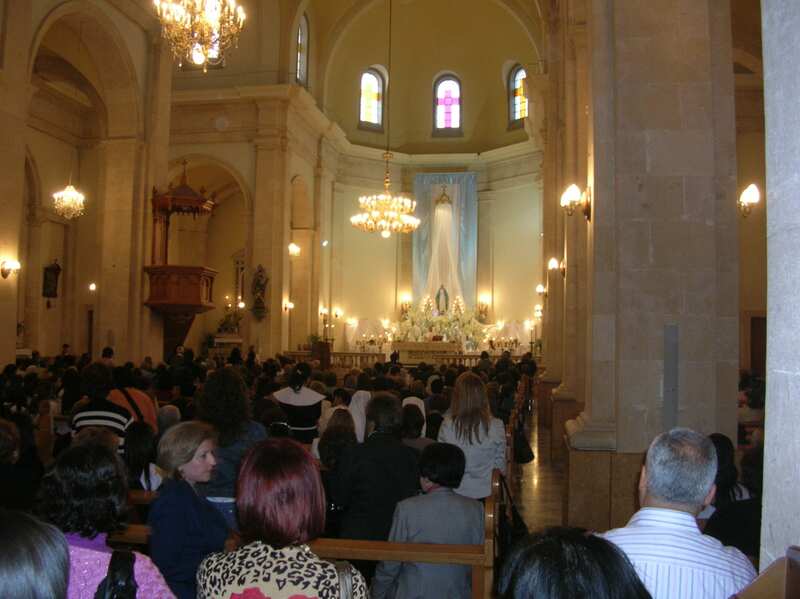 Also being salvaged is the Melkite cathedral, ironically named Our Lady, Queen of Peace. There has been little destruction in the heart of Damascus that remains not only one of the great cities of the Arabian world, but is so ancient that all history seems to have passed through it. Clay tablets have been found that referred to Damashq as far back as 2500 BC, and it is mentioned 26 times in the Old Testament as early as the Book of Genesis. The most dramatic references in the New Testament concern Saul of Tarsus who was on his way to persecute more Christians when he was himself converted. Once in Damascus, he escaped from former Jewish accomplices through an opening in the town wall, the site being commemorated by St Paul’s Chapel behind the Kisan Gate. Another gate leads into the via recta, also mentioned in the Bible, that marks the Christian quarter of Damascus. 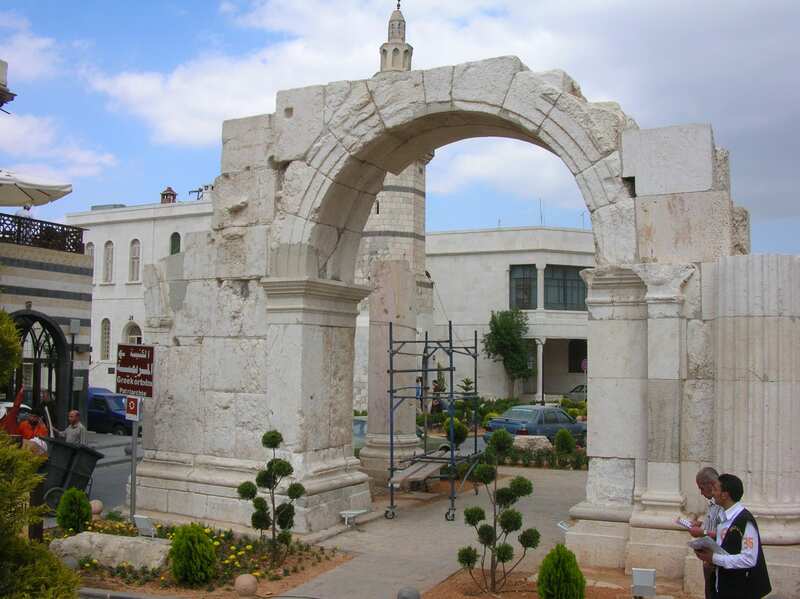 In addition to the likely grotto where St Paul was welcomed by St Ananias, the street is lined with churches of various rites, such as Armenian, Syriac and Maronite, as far as the Roman arch opposite the Greek Orthodox patriarchate. Before the war, the 23 million Syrians included as many as two million Christians, but half of these have since fled. Adjoining is a long decayed Jewish quarter that emphasises how Syria is actually a hotch-potch of races and religions; Arabs, Copts, Turks, Druze, Kurds, Chaldeans, Circassians, Nestorians … Even so, most Syrians are Moslems, two-thirds being Sunnis, while President Assad’s power-base is the moderate Alawite sect within the Shiite minority. Popular with pilgrims from afar as India is the unscathed Shia/Persian mosque named after Mohammed’s grand-daughter, Sayidda Zeinab, who is buried under its golden dome. 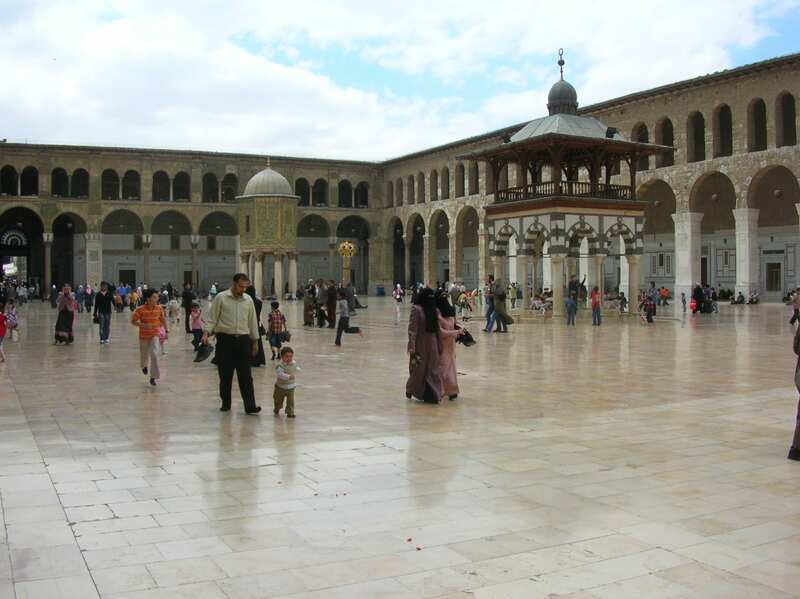 Among 26 notable mosques spanning five eras and several sects, Damascus also boasts the third holiest in Islam, of which it once held the caliphate. This is the Ummayad (meaning great) with a vast courtyard, built in AD 636 on the site of a pagan temple that had become a Christian church. Hence, it is reputed to preserve the head of John the Baptist, despite other claimants. Marked by an equestrian statue outside is the mausoleum of the first and perhaps greatest of Arabian warlords, Saladin, a Kurd who conquered Syria from Egypt. He crushed the crusaders in 1189 only to face Richard the Lionheart soon afterwards and settle for co-existence. Enforced co-existence applies to modern Syria which will must now recover anyway. Getting in may be problematic due to disrupted transport and delayed visas. Try a Syrian embassy long before departure, and remember that anything betraying a visit to Israel – even when the passport has a Jordanian stamp from the Allenby Bridge crossing – will deny entry.